My Christmas scavenger hunt for my horse when I was fourteen years old. It all started one Christmas. I was finished opening my gifts, or so I thought. My mom handed me an envelope and said to open it. I was a disappointed as I didn't get a horse... again. At least that's what I thought. When I opened the envelope and read it, I was thinking "ugh. I actually have to get changed!" I didn't know I was getting a horse, all I knew was that I was going on a scavenger hunt to find the gift. My first clue said, "go look on you're front porch to find your next clue." When I went to the front porch there was a gift and a clue with it. When I opened the gift, I saw horse boots and I thought "what the heck?" When I read the clue it said, "go look in the garage." When I went to the garage I saw another gift with a clue in it. I got a horse blanket and my clue said "go look on your grandparents front porch for your next clue." My grandparents lived close and owned a horse farm, that's where I learned to ride. I ran up to my grandparents porch and they were both waiting for me there. By then I had known I was getting my very own horse. I opened the gift and I got a blue halter and a rainbow lead rope. My next clue told me to look in the barn. I was so excited because I was getting my very own horse!!! I looked in the barn and on the handle there was another gift. Before I opened the gift I opened the stall door and was filled from head to toe with happiness! 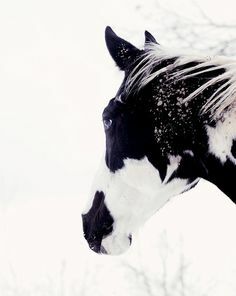 He was black and white with blue eyes, standing about 15.5HH high. I hugged my beautiful new horse! My parents then told me he wasn't named yet even though he was 5 years old and broke. I had decided to name him Beau. My mom slipped on the halter and clipped on the lead rope while I looked at my final gift. In the bag, there was a photo album that showed Beau's parents and also when he was a foal. We grew up together. Taking long trail rides, doing liberty work, helping kids with disabilities ride, entering competitions,and most of all. Becoming friends. Every horsecrazy girl's dream. :) Is it true?